A lot has happened in the last week in the Premier League: the transfer window shut, leaving clubs unable to add to their squads before the end of the season; the man who has managed the third most games in the Premier League resigned; and there was a whole round of fixtures last weekend. However, all of that already seems like a distant memory as tomorrow will be one of the biggest games of Tottenham’s year – home to Arsenal. The North London derby represents the last, best chance Spurs have of breaking the hoodoo of not having finished higher than their arch rivals for the last two decades, as a victory would lift them back above the Gunners in the table. However, the task looks particularly daunting right now, since Arsenal are in their best form of the campaign, have won their last three league matches without conceding a goal, and with Mesut Ozil and Theo Walcott both returning from long-term injuries, they have a plethora of attacking talent at their disposal. In the Guardian this week, they did a selection of combined XIs from the rivalry games that are taking place this weekend (also Liverpool/Everton and Atletico/Real Madrid) and somehow the Spurs/Arsenal team comprised six Tottenham players – a fact that I think will be completely laughable by the end of the lunchtime fixture on Saturday. To be fair, I feared that Spurs would get embarrassed by Chelsea on New Year’s Day and they ended up winning that match 5-3, but the way they have been playing recently – although improved – does not fill me with any confidence heading into the North London Derby. Outside of Christian Eriksen and Harry Kane – both of whom have been in excellent form – there are no outfield players who can be replied upon on a weekly basis. Jan Vertonghen and Federico Fazio have formed a reasonable partnership in the center of defense over the last couple of months, but both are liable to make critical mistakes. In the center of midfield, Mousa Dembélé has returned to somewhere near the player he was when he first joined the club, but unless he is joined by Benjamin Stambouli – rather than Ryan Mason or Nabil Bentaleb – there is no dominance for Tottenham in the middle of the park. The return of Nacer Chadli following a three-week absence for a family issue is actually a huge plus, apart from Eriksen and Kane, he is the only player who has anything like a knack of finding the back of the net. In comparison, the Arsenal squad is full of players who love to get a goal against Spurs: Walcott, Tomas Rosicky, Aaron Ramsey and Olivier Giroud. Throw in Ozil’s ability to completely tear us apart through the midfield and this could be a really messy game for us Tottenham supporters. I was sitting in the Paxton Road end for the 5-4 defeat back in 2004 – probably the worst game I’ve ever witnessed in person, perhaps combined with the 3-4 F.A. Cup replay loss to Manchester City – my fear is that this time, the Gunners might rack up a similar number, but we will be lucky to score even once. So why am I looking forward to a fixture in which I think my team will be heavily beaten? Because there is always the hope that maybe we will win and maybe this time things will be different. But as any other fans of The Shawshank Redemption can tell you: hope is good thing, maybe the best of things (Dufresne); or, hope is dangerous, hope can drive a man insane (Red). In preparation for the North London Derby, both Tottenham and Arsenal had comfortable victories last weekend: Spurs won 3-0 away at West Brom, with Eriksen opening the scoring via another great free-kick, followed by two more goals for Kane; and the Gunners beat a still-goal-shy Aston Villa 5-0. That victory for Arsenal lifted them to joint fourth with Southampton, after the Saints failed to take advantage of their dominance over Swansea and were beaten 1-0 by the Welsh club. In the meeting of the top two sides, Chelsea and Manchester City drew 1-1 for the second time this season, leaving the Blues five points clear at the top of the table. Manchester United are now in third place, following their 3-1 home win against the bottom team, Leicester. Queens Park Rangers will playing away from Loftus Road, so they were inevitably beaten, this time by Stoke who had Jonathan Walters score a perfect hat-trick (left foot, right foot, header). 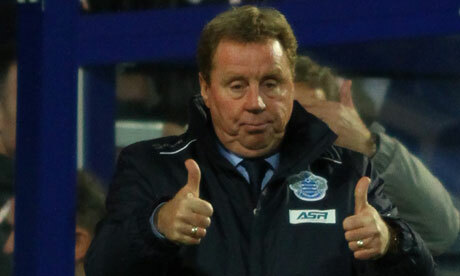 It ended up being Harry Redknapp’s last match in charge after he resigned on Tuesday – coincidentally the day after the transfer window closed, with QPR making no further investments – citing knee issues affecting his ability to do his job. Expect Tim Sherwood to show up in south-west London some time early next week. Elswhere, Alan Pardew suffered his first loss with Crystal Palace, as an early goal from Romelu Lukaku was enough to give Everton the three points at Selhurst Park; Liverpool moved into seventh by beating West Ham 2-0; Hull’s struggles continued as they were thrashed 3-0 at home by Newcastle; and Jermain Defoe got off the mark for Sunderland, scoring their second in a 2-0 win for the Black Cats over Burnley. Saturday’s fixture list is bracketed by the two big derbies – starting with the North London battle; then ending with Liverpool hosting Everton. The two teams are separated by five places and twelve points in the table, so while the Reds are still aiming to qualify for the Champions League, all the Toffees have to play for in this game is pride and local bragging rights. In the other fixtures, the top two have very winnable matches: Chelsea travel to goal-shy Aston Villa; while Manchester City entertain Hull. QPR begin life without Redknapp by taking on Southampton at Loftus Road; Swansea face Sunderland in South Wales; and Leicester desperately need a victory when they host Crystal Palace. On Sunday, two of the bottom six play each other as West Brom travel to Burnley; Newcastle take on Stoke; while Manchester United are in East London to face West Ham.